Due to a lack of time to support and develop TimeSprite, we have decided to stop selling licenses. Refunds are available on request for anyone who purchased in the last 12 months if you feel like this would have changed your purchasing decision. Please contact support@blackhillsoftware.com. Existing customers can also contact support@blackhillsoftware.com for lost license keys and limited support for other issues. Existing customers can also purchase additional license keys if required. Whether you simply want to improve your productivity or you need to fill in a timesheet, you need to know how you spend your time. TimeSprite shows you how much time you spent on different activities on your computer. Find out how much time you spend managing email. Find out how much time you spend on different websites. Find out how much time you spend answering colleagues queries via instant messaging. TimeSprite records the titles of the active window as you work, and intelligently groups similar titles to report how you spent your time. You can assign the recorded window titles to your own groups to create a timesheet. 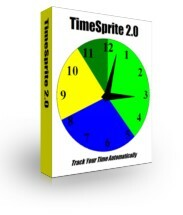 TimeSprite automatically records your time using the title of the window you are working in. Recording stops automatically when you don't use the computer for 5 minutes (configurable). You can view a summary of your time, a journal or diary view, and weekly and monthly timesheets. Make notes in the Journal view. Include or exclude groups from the timesheet. Add, delete or edit entries to adjust the reports. The first step in making more productive use of your time is understanding how you currently use it. Once you have a clear picture of how you spend your time, you can decide where you need to make changes. For example, you might find processing your email once per day instead of keeping your mail program open all the time is more efficient. You can even set reminders to pop up after you have spent a certain amount of time on an activity. Having an automatic record of how much time you spent on different activities makes filling out timesheets much easier. You can view activities by day, week or month or set your own period. You can see the total time for that period as well as the times for each activity. The TimeSprite Monitor can be paused at any time. When it is paused, nothing is recorded. You can define your own activities in the TimeSprite Monitor. When one of these activities is selected, time is recorded against that activity, instead of recording the active window. Recording of user defined activities continues even if you are not using your computer. You can search and delete information that has been recorded. You can search for records by time and/or records that contain specific text. This allows you to remove data that you did not want recorded. TimeSprite does not record keystrokes, or any content from windows other than the title bar. TimeSprite runs on Windows 2000, Windows XP and Windows Vista. Money back promise: If you are unhappy with TimeSprite, we will refund your money within 45 days of purchase, no questions asked.